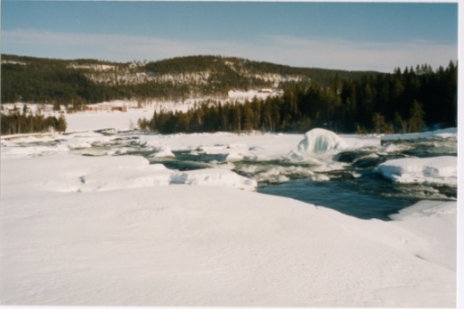 In march 2000, Eric and I visited Sweden for a week. Our goal was to visit the PhD ceremony of a friend of ours, Elbert Jan, in Uppsala. In a wild attempt to get a taste of Sweden and to see the northern lights (aurora borealis), we visited Stockholm, then drove up to Jokkmokk, which lies north of the arctic circle, and made it back in time for the ceremony in Uppsala. We spent one day in Stockholm. 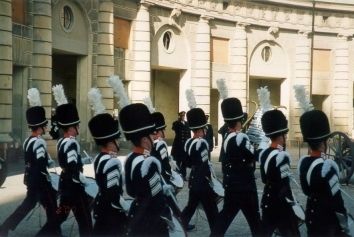 Apart from just walking around the inner city, we made sure we were at the Swedish king's castle in time for the change of the guard. The afternoon was spent at the Vasa museum, which is definitely worth a visit. The gunship Vasa was built in Stockholm, and finished in 1628. On its maiden voyage, leaving Stockholm harbor, the first gust of wind in the sails capsized the ship, and it sank before the eyes of all who had come to witness this event. Its only success lies in that it was preserved on the seabed, and now gives us an intriguing peek at the past. Hoping to see the Northern Lights, we then drove all the way up the east coast of Sweden, following musical names such as Sundsvall, Umeå, Skellefteå, and Piteå, to Luleå. 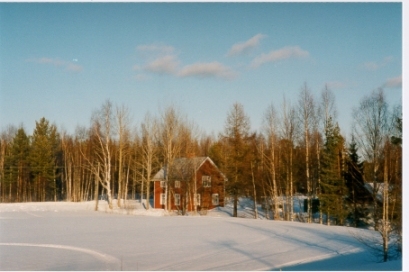 We rented a small but cozy cabin (stuga) at a campground, and spent three evenings packed in our warmest clothes, scouring the night skies... to no avail! 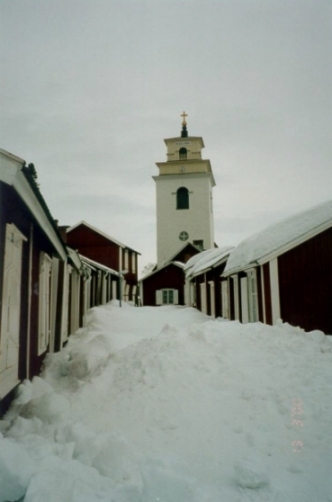 Near Luleå, we visited Gammelstad, a well-preserved church town packed under a layer of snow. 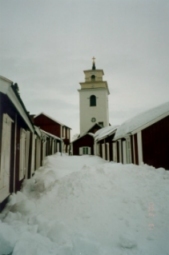 The collection of small red houses, grouped around the church, were only used when wealthy churchgoers came in from the countryside for a religious service. In Jokkmokk, which lies in Lappland, we visited the Sami (the indigenous people, formerly known as Lapps) museum before we were chased back to Luleå by a severe snowstorm. Although we could have simply booked a return flight Amsterdam-Stockholm, there was a much cheaper option: booking a so-called "weekend trip." The deal was a return flight over a weekend, plus one night in a hotel in Stockholm, and we simply arranged that the return flight was one week later. In Sweden we rented a car; this was pretty expensive. We were a little worried about the road conditions up north (roads covered in ice), but this was no problem with our studded tires. The roads - even the main roads - were mostly two-lane (one per direction) but with wide shoulders for passing. The speed limit was low (100 km/hr at most, I believe). It took us about 10 hours to drive from Uppsala to Luleå one-way. Outside of Stockholm, we stayed at hotels that we had not booked beforehand, and at the cottage in Luleå that we had booked. 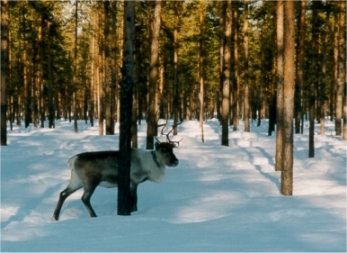 Booking is recommended in the high season. Eating out in Sweden is expensive, unless you do so for lunch; those are good deals! All in all, march is probably not the best time to visit Sweden. Places are closed, it's cold, and Swedes were surprised we were there at all. But... there were no mosquitoes, no tourists, it was quiet, the landscapes were beautiful, and ploughing through hip-high snow really is fun! All towns in Sweden have excellent information facilities. Just follow the signs to the tourist information office, and you'll find everything you need, including maps.